Make a statement in the bedroom with either the bed OR the custom bedding on it. If you have a stunning bed, use a solid fabric such as a quilted silk fabric to keep the bed frame your focal point. If your bed doesn't have much presence, select a designer fabric that adds visual interest and complements the bed frame. Choose soft fabrics and textured fabrics for your custom bedding — velvets, chenilles, soft silks, faux suedes, silky cottons, puffy matelassés and quilted textures. 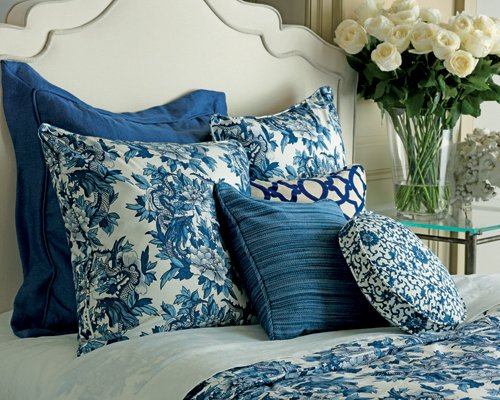 Luxurious designer fabrics and great sheets make all the difference. Add an upholstered bench or loveseat at the foot of the bed. It's the perfect place to put on shoes, to place a duvet or bedspread at night, to put a pretty throw or extra pillows. It's also a good spot for pets to rest or to pack a suitcase. If space permits, create a sitting area with chairs and an ottoman, chaise or small sofa. Slipper chairs are a good choice for bedrooms because of their compact size. It's a nice spot to read — or for one spouse to sit while waiting for the other! Add beautiful custom window treatments to balance the bed visually and soften the architecture of the room plus furnish privacy and light control. If you favor a particular color in a bedroom, vary the hues to avoid a monochromatic room. If you love the look of an all-white bed, be sure there is a contrast with the wall-color — even if it's a deep cream, a pale hyacinth blue or a café latte color. Add accessories in accent colors, such as raspberry pink pillows or a kiwi green chair in an oatmeal or spa blue room. If you have a television in the room, disguise it. Use an armoire, a cabinet or recess it behind a hinged mirror. Remove unused exercise equipment. Move it along to a new home — or relocate it elsewhere. Add a personal touch. Showcase photos of family and friends, stacks of books to be read, favorite art and mementos. Vary the levels of lighting in your bedroom— from low wattage lamps (or dimmers) to candles to lights appropriate for reading. Mirrors can reflect views and bring additional light into the room. Get rid of clutter. Buy fabric-covered boxes or baskets with lids for papers and things that have to be stored. Put a canvas bag in the closet to collect clothes for the drycleaner. Don't sleep in the wrong bed. If the style of your present bed no longer suits you, change it! 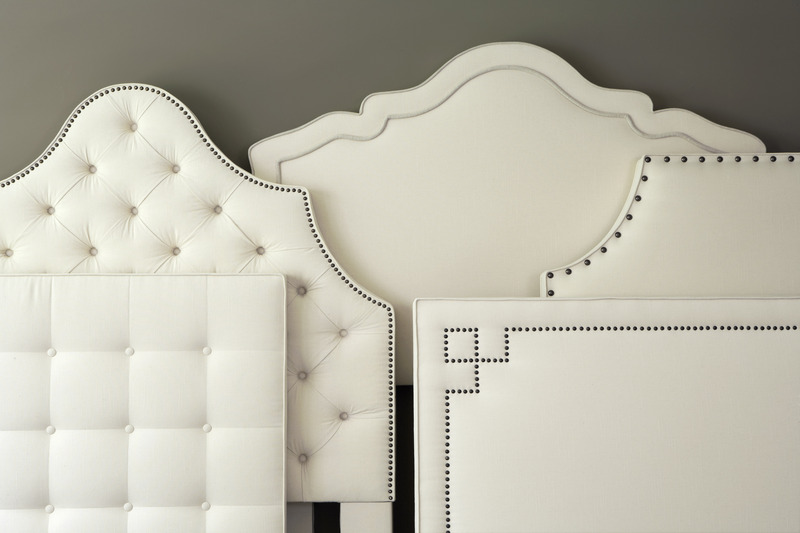 Consider the new upholstered headboards and footboards from Calico as an alternative. Don't over-do pillows. Moving twelve pillows each night is a chore you'll soon resent. Have a smaller number of beautiful custom shams and pillows — four, five or six — and make them important. Don't put your office in your bedroom. It will remind you of all the work to be done. Don't place a bed directly in line with the door. According to Feng Shui, a bed should be placed where you feel most secure. Don't live in a bed that's too low. Buy bed risers that will boost the bed frame by six inches off the floor and take it to the height of an antique bed. Risers are available from any big-box linens store. Don't live with bedding that leave desires something to be desired — duvets that don't meet the bed skirt, bed skirts that are too short or too long, faded pillow shams. You'll spend one-third of your life in bed — it should be a pleasant experience!